Intermittent Fasting (IF) is a powerful tool for health and weight loss. Used wisely, this practice can not only help you reach your weight loss goals, but heal your gut and help remove harmful toxins from your body. However, you must practice intermittent fasting correctly to achieve these benefits. 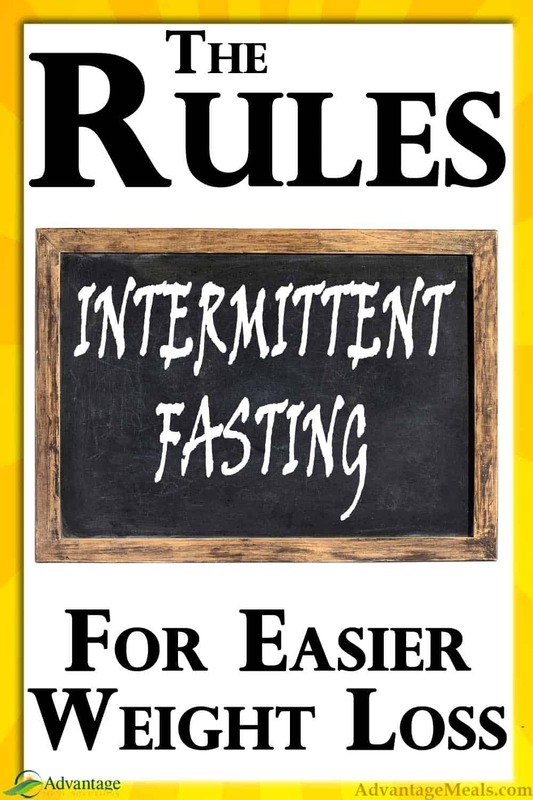 I follow these rules of intermittent fasting to realize the full benefits of this practice. Keep it simple: Eat. Then don’t eat for awhile. Then eat again. Listen to your body, not the clock. Work your intermittent fasting practice around your life, not vice versa. Stop your IF practice during times of high stress. Now let’s dig into the details about why I chose these as our top rules. Intermittent fasting is powerful, and like all power, must be used responsibly. Here at Advantage Meals, we are adamant that there is no one right way to do anything. But there are some wrong ways. And we want to help you make intermittent fasting a useful, enjoyable part of your life. Our rules for intermittent fasting are not meant to be an exhaustive explanation of what IF is or why it works. However, following these rules will help you be healthy and successful while you begin what will hopefully be a lifelong practice to help you reach your goals. Before we dive into the rules, let’s do a little refresher on intermittent fasting. At its heart, intermittent fasting simply means that you are regularly going longer between meals, in order to give your digestive system a break. When your body isn’t busy digesting food, it has extra time and cellular energy to devote to repair and toxin removal, and amazing things happen. I have incorporated intermittent fasting in my life off and on for over a year, and I am convinced of the benefits for myself and those that I have helped start their own practice. You can read about an average day-in-the-life of an intermittent faster here, where I detail some of my common practices. You don’t have to do it my way, though. I generally practice the 16/8 method, but there are so many other ways to incorporate fasting, and they all work. Let’s briefly describe some of the more common IF practices. This practice can be a daily practice, though it doesn’t have to be. With 16/8, you have a 16 hour fasting window, which usually includes the 8 or so hours while you are asleep, and an 8 hour eating window. If you stop eating 4 hours before bed and don’t eat your first meal until 4 hours after you wake, you’re done! Of course, when you start and stop your fasting window can be adjusted to your life, schedule and preferences. People who practice OMAD usually have a 20 hour fasting window and a 4 hour eating window. Another potential daily practice, One Meal A Day actually can involve one main meal and then a snack a couple of hours later. It can be really hard to eat enough calories for your whole day in one sitting! Going a full 24 hours between when you last finished eating and when you eat again. For example, you could finish dinner one night at 7pm and not eat again until 7pm the next day. I have found this practice tends to be better suited to once a week or once a month schedules. What about other types of fasting? While there are lots of ways to practice intermittent fasting, they all involve the fasting window and the eating window. Fasts lasting longer than 24 hours are different and not the same as intermittent fasting. Longer fasts have their own benefits, but they affect your body differently, have different considerations, and are the topic for another discussion. 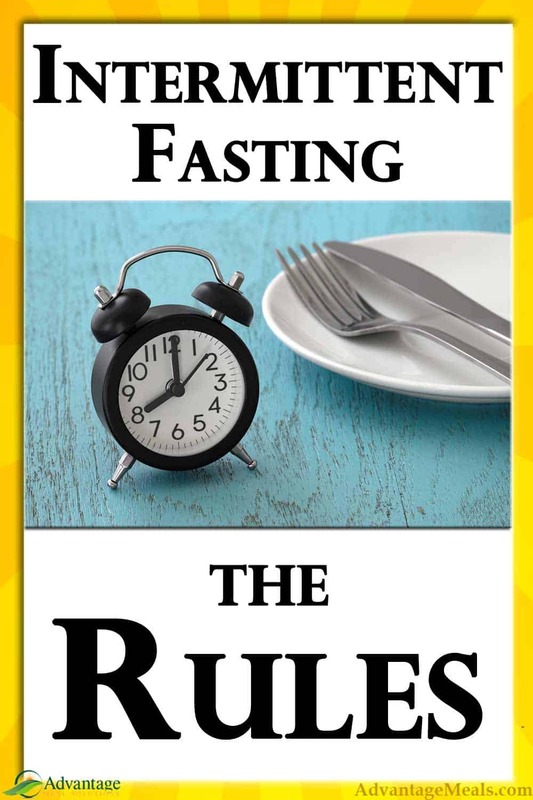 Some people practice fasting while still incorporating specific caloric food or drink. Juice, broth or fat fasts are also different than intermittent fasting and have their own rules and considerations. 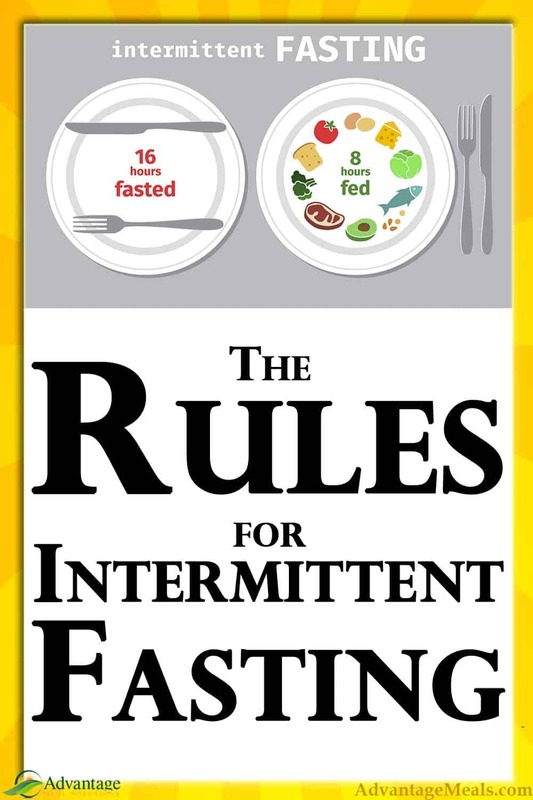 All that said, here are the detailed rules that guide my Intermittent Fasting and that I suggest to family, friends, and clients. #1 – Keep it simple: Eat. Then don’t eat for awhile. Then eat again. It sounds ridiculously simple, and it is. There is nothing earth shattering about the fasting process. But of course, the devil is in the details, which is where the rest of the rules come in. Keep reading, and you’ll set yourself up for success and a lifelong intermittent fasting practice. #2 Ease in to Intermittent Fasting. I know you are excited to start seeing and feeling the weight loss, reduced bloating, increased focus, better gut health and increased energy benefits of intermittent fasting. It can be tempting to just jump in with an IF practice schedule that you’ve seen work for someone else. But we are all unique individuals, and what works for someone else may not be right for you. And we call it an intermittent fasting “practice” for a reason. If your body is not used to going longer periods without food, it will take a little time to adjust to a new routine. Experiment with different methods. If one method doesn’t feel right, try another. Take a break in between, if you want. 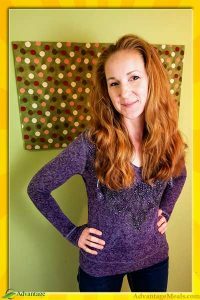 I experimented with 16/8 and 24 hour fasts for several months before I settled into a routine. And when that routine no longer worked for me, I stopped and tried something else. It’s OK to change your mind. Increase your time between meals by increments each day. You don’t necessarily have to go longer between meals every day, though. Stay at one level for a few days if that feels good to you. If you’re really hungry, go ahead and eat, even if you haven’t fasted as long as you did the day before. Forcing yourself to fast will eventually backfire. See Rule #3. #3 – Listen to your body, not the clock. Commitment does not have to mean being militant. I’ve made this mistake before, and the amount of stress you are putting on your body negates the benefits you are trying to achieve with your IF practice. 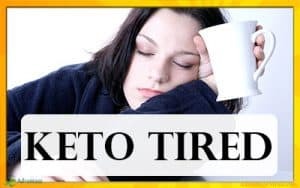 By forcing yourself to go longer between meals when your body is sending you lots of hunger signals, you raise cortisol levels (your stress response hormone) which then causes all sorts of havoc with your blood sugar, among other things. You can watch the clock for a general idea of how long your fasting window has been for a particular day, but each day can be different. The more you practice, the better your body will get at signaling you. Make sure you listen and you’ll feel and look better for it. #4 – Work your intermittent fasting practice around your life, not vice versa. The last thing you want is an IF practice that rules your life. If you avoid your family and friends around meal times because you are fasting and are not comfortable or unable to be with them and not eat, you’re missing out on some of the most important parts of life. Once you establish a general pattern for IF that works for you, know that you can be flexible when new opportunities come up. This is your life. The benefits of IF are great, and they will follow you, even if you don’t fast on date night. 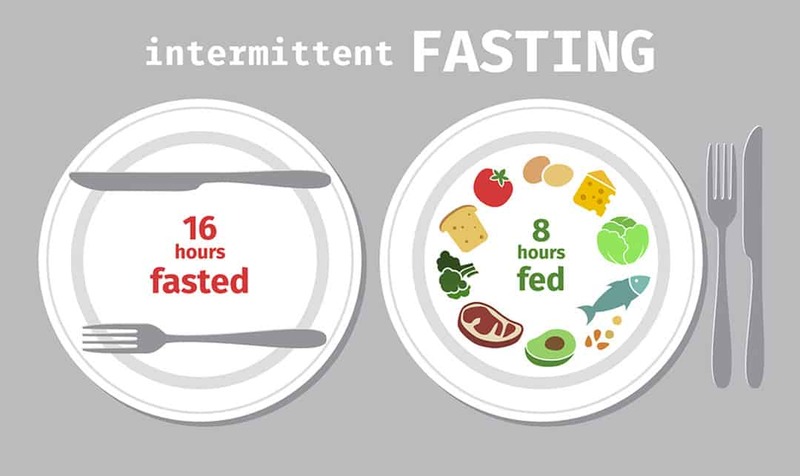 A lot of the benefits of intermittent fasting stem from autophagy, which is the process of your body removing and recycling old and dead cell structures. You want this to happen! Toxins are also removed from your cells while you are fasting. And all the cellular trash and toxic particles have to be removed from your body, which is where the water comes in. Drink plenty of water during your fasting window (and also during your eating window) to flush all this unwanted garbage out of your system. I find that having a large glass of water also helps relieve habitual eating patterns. If you find yourself wanting to eat something out of habit, drink a glass of water. If you’re still truly hungry after 15-20 minutes, then eat. See rule #3. Fasting also produces a mildly ketogenic state, even if you’re not eating a ketogenic diet during your eating window. Particularly if you do eat Keto (more on this in a bit), water becomes even more important. Ketosis is diuretic by nature, causing you to excrete more water than you would on a carb-based diet. Add fasting and you’ll need more water to make sure you don’t get dehydrated. Along with all the toxins and dead cells that you’ll be flushing out of your body, you’ll also lose some valuable minerals. Sodium, magnesium and potassium are vital electrolytes that will need to be replaced. Sodium can be replaced by salting your food to taste during your eating window, using a high quality pink sea salt. You’ll get the sodium you need and also some other trace minerals along with it, to keep the sodium in balance. My favorite way to incorporate magnesium is with Concentrace Trace Mineral Drops. Magnesium is the largest percentage mineral in the solution, along with other trace minerals. I put a few drops in every glass of water I drink. You can do this during your fasting window as well as your eating window. Potassium is well absorbed from food, and two good sources are avocados and dark, leafy greens. 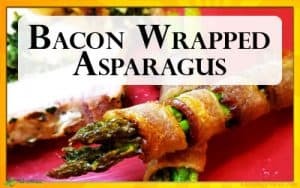 Consume these regularly during your eating window. If you take other supplements, consider taking them during your eating window. This is particularly important for fat-soluble vitamins or other supplements that are best absorbed with food. Apple cider vinegar can be incorporated during your fasting window, and a dash in your water adds a little flavor, along with acetic acid and trace amounts of vitamins and minerals. Acetic acid can increase the absorption of minerals, which is helpful. There are a lot of other claims about the benefits of apple cider vinegar. While the research is still out on many of them, consuming 1-2 tablespoons throughout your day is generally regarded as safe and may have benefits. Caffeine is a drug that you may consider as a supplement during your IF practice. Drinking caffeinated coffee (black, no cream or sugar!) is completely fine during your fasting window, and it may help. Caffeine is an appetite suppressant and may help you prolong your fasting window without being uncomfortable. #7 – Use coffee wisely. If you’re drinking coffee all morning long to stave off hunger pangs, you’re not really listening to your body. One cup to get past a cyclical ghrelin hormone spike can help you out. A whole pot just to make it a couple of extra hours before you eat will not. Also, coffee is a diuretic, causing you to lose more water. As we’ve already covered, there are multiple reasons to make sure you stay hydrated. Avoid excessive coffee to avoid dehydration, and make sure you have an extra glass of water for each cup of coffee you do drink. #8 – Don’t ignore “little” calories. Ingestion of calories will take you out of fasting mode, even if you drink them. We sometimes think that only solid food will have an effect on our fasted state, but that just isn’t the case. 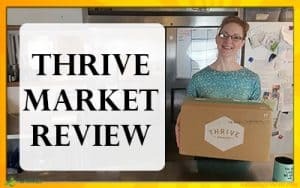 Protein, carbs and fat all require metabolizing, and when your body is working on ingesting and metabolizing those calories, it’s not working on toxin removal and cellular repair. There are some people who practice “fat fasts” that include pure fats like MCT oil. Or bone broth fasts where real broth is all that is consumed. These have benefit, but in order to get everything out of your fasting window, save these caloric foods for your eating window. If you’re hungry, it’s ok to go ahead and eat, no matter how long you’ve been fasting or what the clock says. When it’s time to eat, just eat. Don’t eat extra to stock up for your next fasting window. Don’t pig out or eat a bunch of junk to “reward” yourself. Don’t purposefully restrict your calories. Just eat your normal, healthy diet. 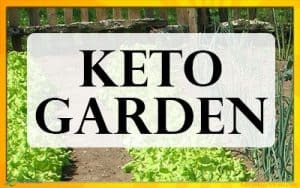 You can practice IF with any way of eating, but we believe that a fat-adapted Primal diet and a ketogenic diet are ideal. Being fat adapted (your body is used to using fat as an energy source, along with or instead of carbohydrates) makes intermittent fasting much easier. When you eat a carb-based diet, you are subject to the insulin roller coaster, and when insulin levels drop during your fasting window, your blood glucose will, too. If your body isn’t used to switching over the fat when there aren’t any carbs around, you’re going to get really hungry. And it’s hard to fight your hormones. 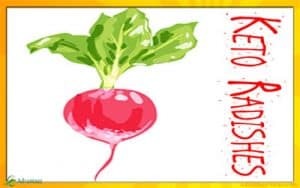 Eating a ketogenic diet not only means that your body is already using fat as its primary fuel source, you’re already ketone-adapted, too. 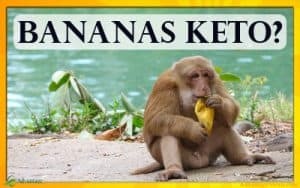 The fasted state is natural for your body, your brain has plenty of fuel from ketones, and your hunger signals are much different and farther between. The reduced hunger on a Keto diet tends to lead naturally to intermittent fasting. 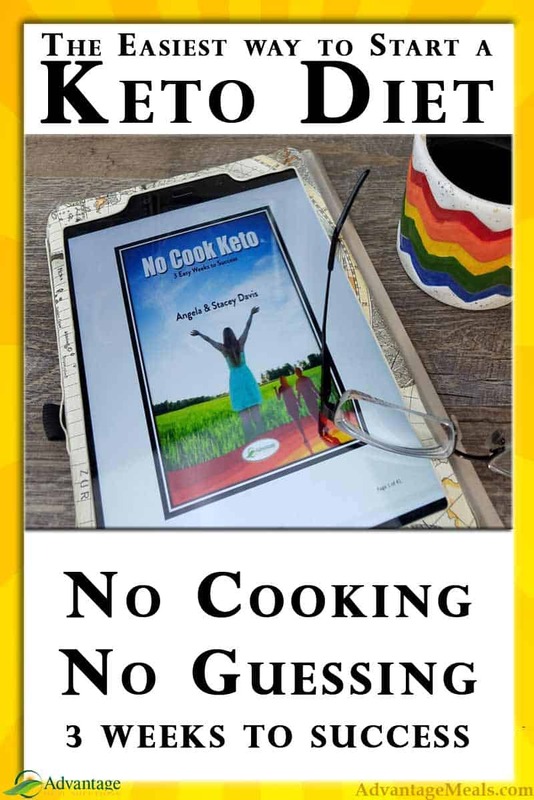 In fact, we truly believe that this natural tendency toward intermittent fasting is the “secret sauce” to the weight loss and health success often seen with a Keto diet. Keto and fasting are like flip sides of the same coin, and they just go together. #10 – Stop your IF practice during times of high stress. Intermittent fasting is itself a hormetic stressor, or “good stress.” Hormesis means there is a growth response after a small dose of stress, so you come out the other end of the stress better for it. So while the stress of intermittent fasting is part of what supplies its benefits, it’s still stress. It taxes your mental and physical capabilities. If you are adding the stress of IF to an excessively heavy exercise routine, forced caloric restriction, lack of sleep, major life changes, uber-demanding family or work responsibilities or any of the other possibilities this life may throw at you, it could lead to too much stress. And when there is too much, no stressor is “good stress”. They’re all just too much. If life is throwing you for a loop, leave the intermittent fasting off for a while. It will still be there when life settles down, and chances are you fall back into it naturally. You can absolutely exercise while you practice intermittent fasting. Provided you don’t over exercise, of course, and get appropriate rest between workouts! There is even evidence that working out during your fasting window will ramp up the fat burning effects. Always listen to your body. Don’t force exercise if you are hungry or just don’t have the energy. Exercise is also a hormetic stressor, so be careful that you’re not piling on too much. If you feel good, though, go for it! Do whatever kind of movement feels right for you and appropriate for your fitness level. Almost everyone can walk, and low-level cardio like walking falls right in the fat-burning heart rate zone. Consider strength training (bodyweight exercises don’t require equipment or a gym! ), mobility training (yoga and tai chi are great) and even High Intensity Interval Training once or twice a week, if you’re up for it. 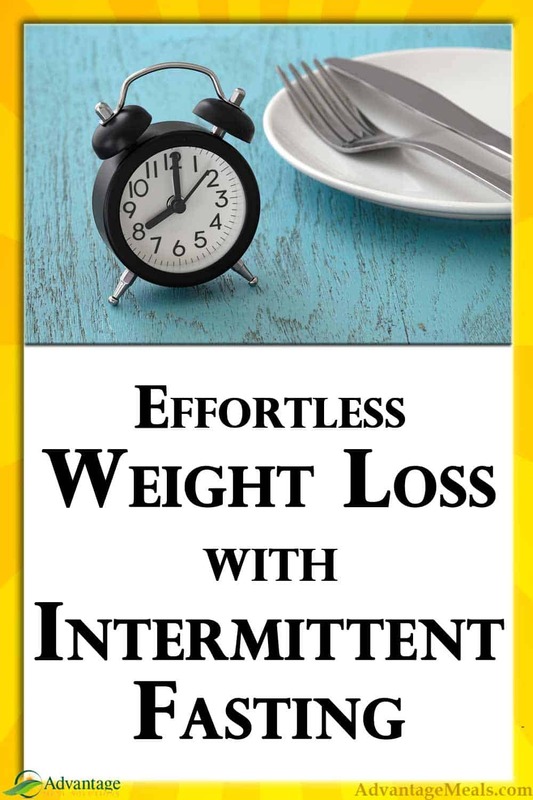 Intermittent fasting has so many health benefits, and may be the most important factor in effortless weight loss; especially when combined with the Keto Diet. While there is no one right way to intermittent fast, using these rules as a guideline will help you find your own way to intermittent fast and reach your goals. If you found this article helpful, please leave a comment below. Anna – Any kind of vitamins would be considered a supplement, and many of them are best absorbed with food. Coffee is totally optional! 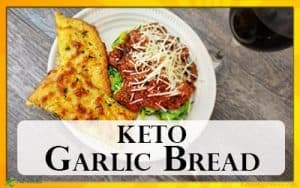 If you found this Keto Article helpful, please share it to help others! We’re all in this together.